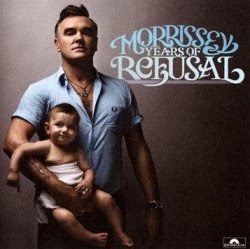 Morrissey - "Years of Refusal" - Morrissey is back with the follow-up to 2006's "Ringleader of the Tormentors," and delivers arguably his strongest release since the 90s. "Years of Refusal" is packed with a punch not heard on much of his other recent work, and features an assortment of strong tracks including the punk romp "Something is Squeezing My Skull," the mariachi-tinged "When I Last Spoke to Carol" and the driving rocker "All You Need Is Me." ...And You Will Know Us by the Trail of Dead - "The Century of Self" - The Austin-based art rockers release their sixth album, the first since 2006's "So Divided." M. Ward - "Hold Time" - The singer-songwriter from Portland and one half of duo She & Him releases his sixth solo album. Coupleskate - "Don't Scare the Horses" - This all-female indie rock band from Chicago released their debut LP on February 13. You can check out the music video for the opening track, "Laws of Physics," on their official site, and pick up the music via CD Baby or iTunes. Pet Lions - "Soft Right" - This up and coming local band play a highly addictive mix of indie rock and classic power pop, and have just released their very strong debut EP, "Soft Right," (reviewed here) for download via DigStation.com. They will play an official release show March 7 at Beat Kitchen.